KABUL, Afghanistan (CNN) -- Every morning Sangin Mohammed Rahmani says goodbye to his wife, gets on his bicycle and sets out alone on a bumpy, unpaved Kabul road that he hopes will lead him to the presidency. 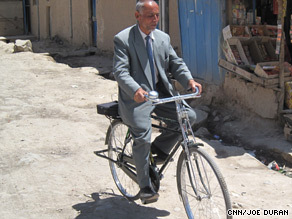 Presidential candidate Sangin Mohammed Rahmani goes out campaigning on his bicycle. "This is going to be my vehicle to success," he says, patting his bicycle, as he pushes it down a rutted, garbage-strewn street. "With my bicycle and my mobile phone, I can solve all the problems of the people." In a crowded field of 41 Afghan men and women running for president in the August 20th elections, Rahmani stands out because of his one-man, bicycle-borne campaign to become commander-in-chief. His is an unusually humble strategy in a society exhausted by decades of civil war and warlord-ism. Unlike other, far wealthier candidates, who travel around in helicopters and armed convoys, Rahmani is a virtual unknown; a retired Afghan army officer who scrapes by on an $830-a-year government pension. He can't afford an office, and barely makes enough money to pay rent for his family of seven, so he has been improvising by campaigning on a Chinese-made bicycle that costs the equivalent of around $70. Afghans seem surprised and amused when Rahmani, a diminutive bald man dressed in a baggy, double-breasted gray suit and tie, pedals up to a street corner and introduces himself as a candidate for president. "I'll give you one of these fliers, it includes my biography," he says, while handing a photocopied flier out to a small group of illiterate street vendors. "Just read it, then you can throw it out. Do whatever you want to do with it." Moments later, Rahmani asks taxi driver Mohammed Yassin for permission to place one of his campaign posters on a street corner. "I want to put up a poster of myself, so people don't say, 'This guy's a candidate, but he doesn't even have a poster,' " Rahmani explains, as he clambers up onto the seat of his bike to stick the poster high up on a lamppost, using scotch-tape. The taxi driver, Yassin, helps steady the bike for Rahmani. "He's an independent candidate," Yassin says with a smile. "He does his work himself." In a city where impoverished residents are accustomed to watching politicians race past in armored SUVs that cost tens of thousands of dollars, Rahmani's grass-roots approach quickly wins admirers. "I want him to do well," says a shopkeeper named Fawad. "I think he's a man of the people." "We want someone who loves and cares about the poor and the destitute," says a watermelon vendor named Zalmai, who complains that the police regularly shake him down, demanding weekly bribes for the right to set his stand up on a dusty sidewalk. "We don't want a tyrant, someone who oppresses the people. All we want is security." Rahmani's one-man crusade to occupy the Presidential Palace may look comical at times, but it comes loaded with very serious criticism of Afghanistan's western-backed government, which he accuses of stealing billions of dollars in international aid. "The international community does not understand that this government in Afghanistan is a government of force, of nepotism and waste," he says. "Since ancient times, governments in Afghanistan have been formed through coup d'etats and violence... The elections are a big blessing. This is a big opportunity and blessing because every person can determine his own destiny and the destiny of the nation." The upcoming election will mark the second time Afghans will go to the polls to pick a president since the overthrow of the Taliban in 2001. International donors are helping pay for the massive $223 million undertaking. More then 101,000 American and NATO troops are also on the ground, fighting and dying in record numbers to make polling stations safe from a Taliban insurgency raging in southern and eastern Afghanistan. Incumbent Afghan president Hamid Karzai is believed to be a front-runner in the electoral race. Afghan political analysts say Karzai's chief rivals are his former foreign minister, Dr. Abdullah Abdullah, and his former finance minister, Ashraf Ghani. Compared to these well-funded candidates, Rahmani is unlikely to generate much support at the polls. This despite the fact that he has already made campaign trips on his bicycle to stump in two neighboring provinces. "My husband has a big heart, but very small pockets," Rahmani's wife explains, after serving guests cookies and glasses of orange soda at the family's modest residence. Before launching his political career, Rahmani published a book of poetry and a book titled "Political Struggle Without any Money." He says he has one wish, in the final weeks before the election. "I would like to meet with the ambassador of the United States for 10 minutes," he says, "so that I can explain to him the troubles of Afghanistan."